oh, sweet joy! : announcements//a before & after. A few announcements, then we'll get to the good cute stuff. 1. Until I get unpacked, settled in, and on a normal schedule, ((which should be in the next week or two)) all Favorite Things Friday, Handmade Monday, and other "routine" posts will be postponed. 2. If you would like to advertise with Yellow Songbird, please e-mail me for the new 2011 rates. 3. Oh, Sweet Joy will (re)open up shop on Friday, January 14th. Get ready & excited for new fabric frame necklaces, headbands, earrings, as well as new products soon to come. I was a bit distracted yesterday and couldn't quite get in the groove of unpacking. This lamp was a thrift store "score" when Chase & I were engaged and working at a summer camp together. On one of our days off, I found this yellow lamp and had to have it. I'm pretty sure it only cost $7. 3 moves later, the lamp shade was a bit beat up distressed looking. I got this fabric from City Craft in Dallas last Spring & had been using it for my craft show table. Inspired by this Restyle on Skunkboy Creatures, I decided to cover the shade with it and use some bias tape from my stash for the bottom trim. I'm pleased with how it turned out! It doesn't let very much light through, but it's pretty darn cute, if you ask me! :) It took about 30 minutes, using my glue gun. Not too shabby! I love love love the lamp!! It looks just perfect!! Gorgeous lamp! Love te colors! p.s. i'm def. emailing you soon! i need some tips on the handmade market for april. getting nervous and little overwhelmed!!! but no rush, you settle down first!! love ya. 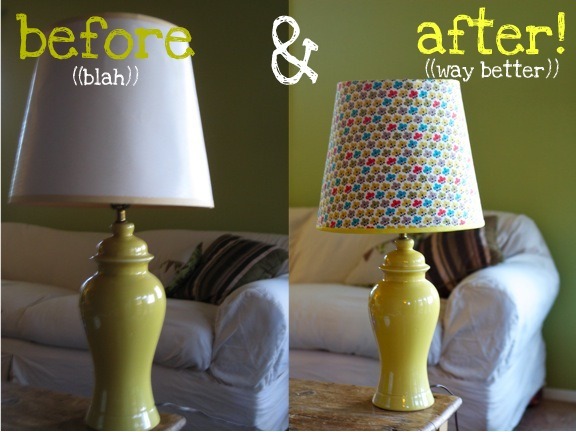 That lamp shade turned out darling! Dave + I are working on a wall art piece for our newly remodeled bedroom. We are basing it off of our Dear Dave + April Tuesday Series! Can't wait for it to be finished to share!! I really like the way the lamp shade turned out! Looks great. So cute! I'm currently working on too many things. A repurposed frame that will soon be framing a chalkboard. Painting my dresser and bedside table. Recovering a chair. Oof. I'm excietd for your store to reopen. So many friends have asked about the necklace and headbands I bought last year. I love your DIY posts! I am heading out to goodwill this weekend and hoping I can find something I can put in the house! You've inspired me to go bright and bold! Yay! Oh my- what a fab lamp! I love that you got it when you were engaged and it's survived the moves. It looks adorable. Thanks for linking up to my Pity Party. Loooove the lamp! It's so cheery. Great job, Kim!